ISHIKAWA Kazumasa was born in Owari in 1533. He was one of senior vassals of TOKUGAWA Ieyasu but became to serve TOYOTOMI Hideyoshi suddenly in 1585. He is regarded as the first lord of Matsumoto Domain. He had served Ieyasu when his days as hostage of the Imagawas. After the Battle of Okehazama, he negotiated with IMAGAWA Ujizane and got Sena, wife of Ieyasu and their children. In 1562, he negotiated with ODA Nobunaga and established the alliance between the Odas and the Matsudairas. When the Battle of Azukizaka in 1594, the riot of the believers of Jodo Shishu sect of Buddhism occured, he who believed in the sect converted another sect Jodo Shu. Besides, he distinguished himself in many battles. There are various theories about the reason why he betrayed Ieyasu. Anyway, he was granted Matsumoto in Shinano as a fief after the Siege of Odawara in 1590. He built a magnificent castle there and developed regional infrastructure. He died in 1593. 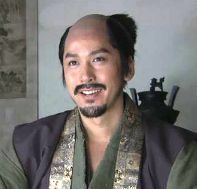 In this drama, he supports young Ieyasu (Motoyasu) well and returns to Okazaki Castle with him. In Okazaki, he guards Sena and her children. FUKUSHIMA Masanori was a samurai who served TOYOTOMI Hideyoshi and TOKUGAWA Ieyasu. Like Kato Kiyomasa and Katagiri Katsumoto, he is one of the Seven Spears of Shizugatake and famous for his reckless valour. He was born in Owari in 1561 and served Hideyoshi as page at first. Then he distinguished himself in various battles and ruled Imagbari In Iyo (current Ehime). In 1590, he participated in the Siege of Odawara and the invasion to Ming in 1592. Then he returned to Japan and in 1595 he transmits the orders of hara-kiri to TOYOYOMI Hidetsugu who planned a rebellion against Hideyoshi. After the death of Hideyoshi, his relationship with IShida Mitsunari worsened and got along with TOKUGAWA Ieyasu. After the Battle of Sekigahara, he became a daimyo of Hiroshima domain and made effort in administration. On the other hand, he also served the Toyotomis but it made Ieyasu mistrust him and he was not allowed to participate in the Siege of Osaka. Later his territory was confiscated because of the reconstruction of Hiroshima Castle without the permission of the shogunate. Then he moved to Takaino domain in Shinano and died there. He was a deep drunker. But one day, he lost the drinking competition with Mori Tahei, vassal of KURODA Nagamasa and gave him his favourite spear called "Nihon go". Besides, he is said to have been a henpecked husband. In this drama, he is described as a tall and openhearted man but is easily moved to tears. When he visits Hidetsugu in Koya-san after his scandal, he weeps over his suicide. During the siege of Osaka, he complains of his treatment to SANADA Nobuyuki who doesn't fight in the siege either. 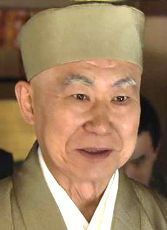 SEN no Rikyu (Soeki) was a merchant of Sakai and a master of tea ceremony. He was born in 1522 and served ODA Nobunaga as instructor of tea ceremoy and then TOYOTOMI Hideyoshi. He committed some important tea ceremonies including the one at court and his taste influenced the style of tea room and teacup. But he was ordered to shut himself up to his house by Hideyoshi and committed hara-kiri in 1591. Though there are various opinions about why he was discord with Hideyoshi. Some things as Rikyu-bashi （chopstick）or Rikyu-dana (furniture) are named after him. In this drama, he is described as a keen businessman and meets SANADA Nobushige in Osaka Castle for the first time. 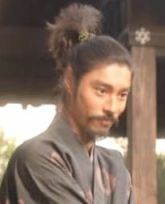 He sells goods even during the Siege of Odawara in 1590 but Nobushige finds that he also sells pig lead, material of musketball to the Hojos, the enemy of the Toyotomis. This and some other affairs made Hideyoshi angry and he orders him to stay in the house and at last He commits Hara-kiri. Before it, he performs the tea ceremoy and serves it to Nobushige. She is thought to be the first Yoshino Dayu. Though tayu (geisha girl*)s who suceeded the professional name of Yoshino Dayu are ten, and the second is most famous. But the first is said to have acquainted with the educated people and celebrities. 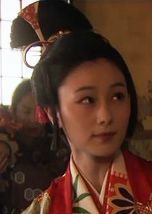 In this drama, she is a tayu of Osaka and is patronised by TOYOTOMI Hideyoshi. SANADA Nobushige also asks for her to entertain his father Masayuki and brother Nobuyuki when they visit Osaka though he doesn't has enough money. And Masayuki, who becomes to live in Sanada's residence in Osaka visit her frequently in secret. However one day Masayuki finds that she behaves strangely and is nearly killed by her. He is saved by Ideura Masasuke who is a ninja and knows him very well. The Yoshino Dayu is not a real one but a spy of TOKUGAWA Ieyasu. (*) Tayu is not a prostitute. She entertains people with such things as song, dance, making poem, tea ceremony, and board game.